Many would agree that Close-Up Magic is the purest form of magic. The props used are so close to you that you can reach up and touch them. And often you're asked to do so. Props range from the popular deck of playing cards to things like coins, balls and even something borrowed from you like a dollar bill or a pen. The illusions are so mystical, you would not believe it could happen if you did not see it for your self. This is typically performed while strolling around your establishment. 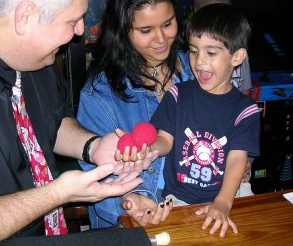 Walking around and mingling with the crowd, Close-Up magic involves lots of audience interaction. This style of entertainment is ideal for working with individual groups, large or small, and is often performed at restaurants, hospitality suites, banquets and more. Balloon gifts can also be incorporated to create many magical memories. This type of entertainment at restaurants is verry popular. We can turn your dinning location into a dinner theater! 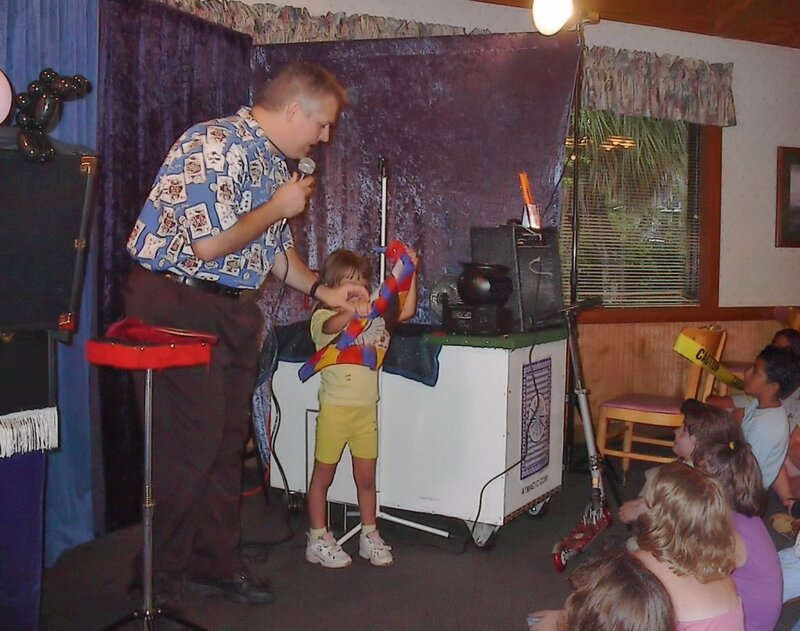 A different Stand-Up Magic Show is performed every time, so your customers will always see new exciting material on each and every visit. You may even choose any of the shows designed for specific age groups. Children, Adults, and a mixture of all ages. We are self-contained, have our own sound system, backdrops and lights. All we need from you is a location and an audience. A very popular service we are now offering at Restaurants is the Face And Body Temporary Airbrush Tattoos. It is the latest thing in High End Face Painting, Body Art and Temporary Tattoos. Airbrush art is also faster than paint brushes so can accommodate a larger number of people in less time. 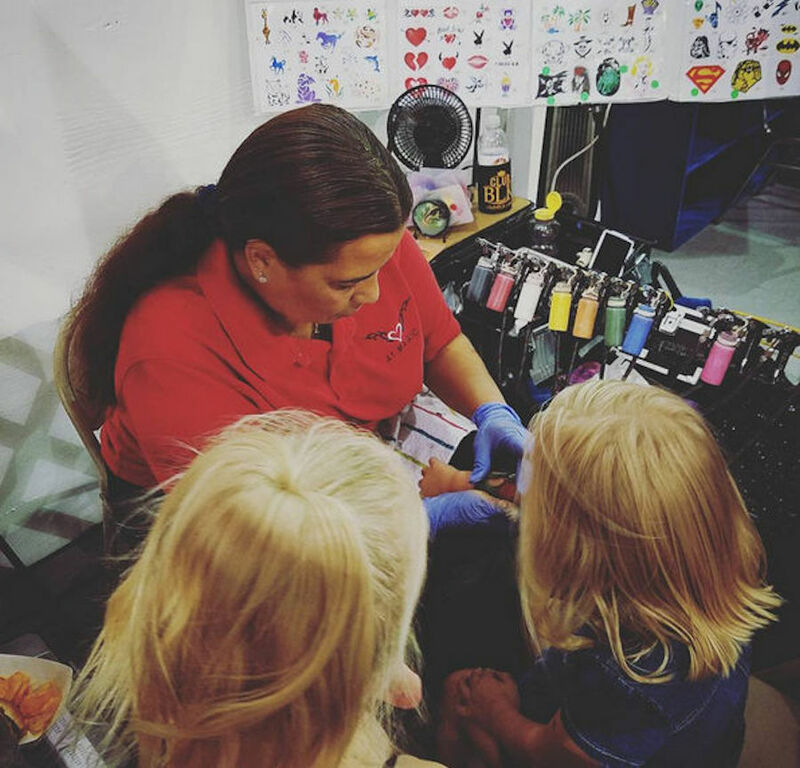 Not only the children enjoy the fun selections of temporary airbrush tattoos, the adults like to plunge into their fantasies too! Best of all, we use the water based, hypoallergenic makeup paint that washes off with soap and water. So you want to have balloons in your restaurant? Does it make sense to put an amateur in your establishment, constantly popping balloons, annoying your customers asking for money they didn't plan on spending, just so a child will get a balloon that doesn't even look like what the child asked for? That makes about as much sense as allowing someone with no experience in your kitchen to cook for your customers, even despite the fact that they work for free or they agree to only be paid by tips! Why should you hire a professional? Figure it this way, why should your customers pay $8 for one of your hamburgers when they can get a hamburger for 99¢ around the corner? The answer is QUALITY, SERVICE AND RELIABILITY! We don't just teach some college kids how to do a couple of balloons animals, and then put them in your place of business to harass your customers for money. That is NOT ENTERTAINMENT! Some of them don't work well with people, don't have any charisma, have never really been a performer and don't even need a job, and that's if you can get them to show up at all!. To them, it is just something to do for some quick weekend cash, and they have virtually no reliability or accountability. They don't care if they upset a customer. They don't really work there! The only thing that will do is eventually annoy your customers into not returning. Is that worth having a free balloonist? We are professional ENTERTAINERS! With us you get QUALITY, SERVICE AND RELIABILITY! We don't run your customers off, on the contrary. We increase your business because the experience is so enjoyable, they will want to keep coming back and bring others with them. And most important, we don't wear tacky buttons asking them for more money! In fact, it doesn't cost them a penny more, so they won't feel threatened or be put on the spot in these financially trying times. They are there to spend money with you. 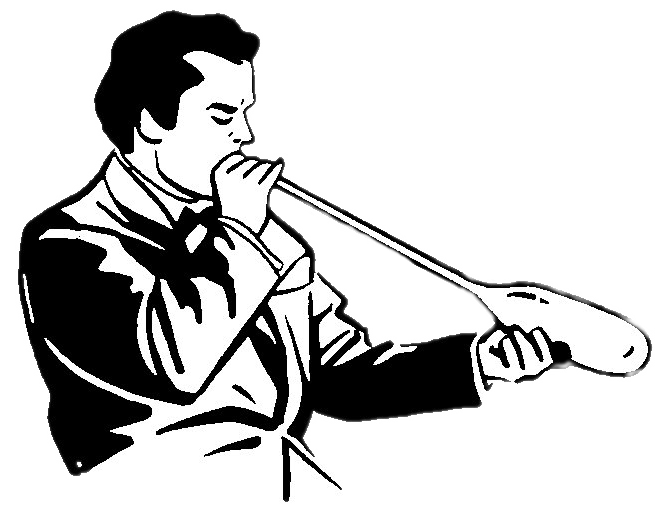 We are there to enhance their family dining experience by providing tableside Close-Up Magic, Temporary Airbrush Tattoos that can only be found at large events, and yes, quality balloons too.